At long last our ancient Samsung 32″ LCD TV threw its final wobbly, going ultra-high contrast with weird colours. It started on the final stage of La Vuelta a Espana, at the end of the stage I remarked to my better half that Quintana was looking a little more red in the face than normal, and it just got worse from then on! After a day of trying to watch in what was getting to look like a negative image, we decided to look for a replacement. We didn’t have huge demands – it must fit on our wall bracket (200mm vesa), so is limited in size to 40″ or so. It must have two HDMI sockets, one for the Panasonic Blueray Freeview HDD recorder, and one for the computer that is part of our system. It must be Freeview+ capable, and finally, we must be able to feed the TV sound back into our stereo system to use the nice speakers we have by the TV. After some research, we decided on a Panasonic Smart 43″ which according to the specs had everything we wanted, with the addition of talking to our Panasonic set top box via the HDMI connection – giving more versatile use of the remotes. So off we trot to the local store, where it is on special, but only until the end of that day. So with $300 off, it is looking like a good deal. Unboxing and basic installation was quite easy, 20 minutes to getting it on the wall, tuned and watching TV, with freeview box, computer and wifi all connected. Great quality, lovely picture, even the TV speakers weren’t too bad. Phase two of installation was getting the TV sound back into our Onkyo Stereo Receiver, which is a few years old, and analogue only. The spec we read said that the TV had audio out through a shared RCA socket, and also had a headphone socket. Well, the spec lied, its only audio out is an optical digital connection (TOSLINK). I think the spec covered three models, the 43″, the 49″ and the 55″, so it may have been my mistake. So what to do? A bit of searching found this Optical to Analogue converter at Rapallo. So, it was ordered, along with a TOSLINK cable and a USB to 5.5mm power connector so that it could run off the TV power. Was I in trouble here? A bit of delving in the TV menus – Menu/Sound/Digital Audio Preferences gave me a choice between a Dolby D and HE-AAC as my preferred Digital Audio format. I switched from Dolby D to HE-ACC. Problem solved! TV, DAC box and Stereo system all playing nicely together again. The second issue was with using the TV as output from my ACER L3600 small format PC sitting in the same cabinet. I also output to a Dell monitor nearby. With the old TV everything had been working fine, and I really did expect no issues with the new TV. However, the output on the TV was missing about 1 cm off the lower and left hand sides, causing important icons on the task bar to be somewhat less than visible, including the start button. The top and right were also truncated, but this did not affect use of the computer. I tried multiple resolutions and configurations on the PC, but nothing worked. Eventually, I decided it was the TV and went rummaging in the menus again. At Menu/Picture/Screen Settings I found an option called “16:9 Overscan” with On/Off options. I switched it off, and the screen was back to what I expected, with no noticeable difference in any TV option either, but I suppose I am now seeing more of my TV picture as well as more of my computer screen. Why would I deliberately want to lose the edges of my picture? This link here describes what overscan is and why it happens. Interestingly, both of these menu options are not immediately obvious or visible, in both cases they are part of a list that goes onto a second page, and you need to page down to find them. 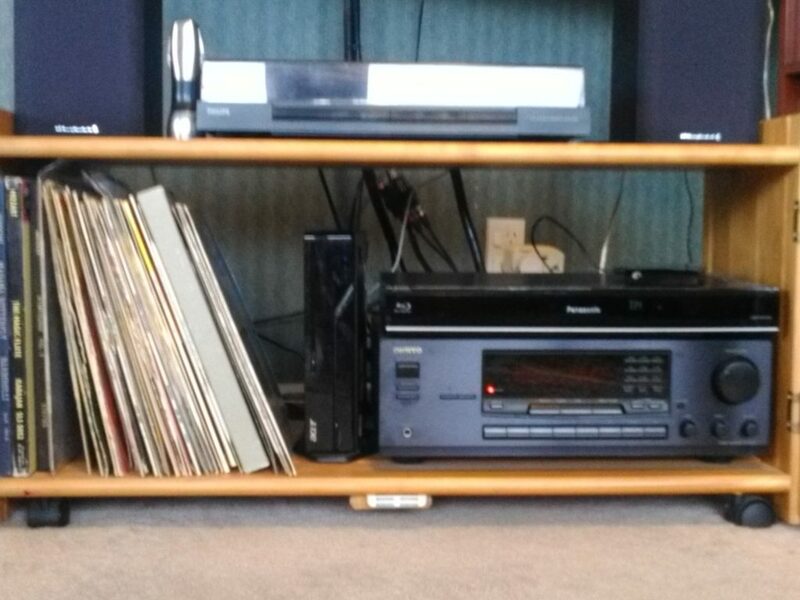 In the picture above, you can see the ACER computer (centre – vertical box), the ONKYO receiver (bottom) and the Panasonic Freeview recorder, and above the Wharfedale Speakers. The deck is a cheap Philips item, which is surprisingly good. There are a pair of KEF C20 speakers also attached for listening to music. Below is a schematic of how the various components are connected. Simple isn’t it? Including the TV, there are now three devices connected to the wifi, the Panasonic FreeView recorder is also “Smart”, and the Acer computer is wifi connected too. 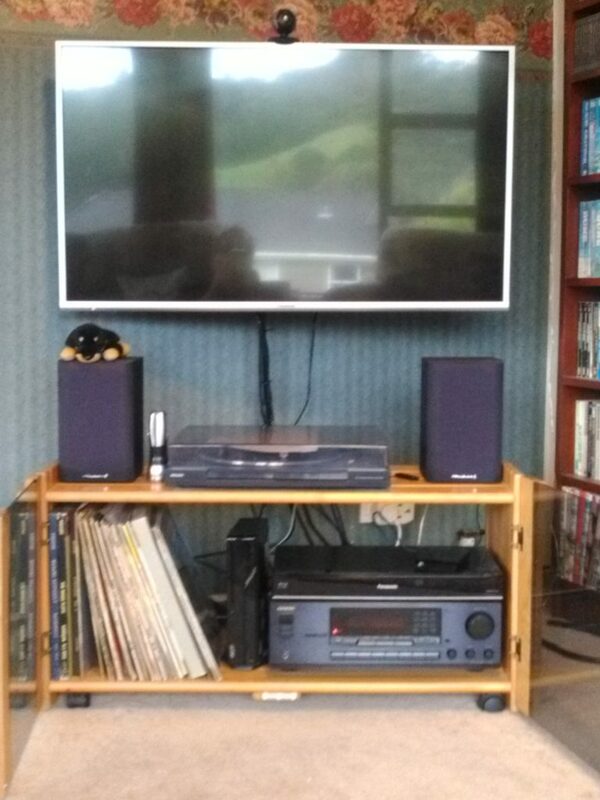 A cheaper set up in the family room consists of a 24″ Samung Freeview TV connected to a Philips soundbar, with a Raspberry PI OSMC media centre computer attached. This will connect via wifi to the Panasonic Freeview recorder in the main system, allowing access to recorded TV in the family room. The UHF antenna is a phased array high on the roof, with an amplifier attached. We get signal strength and quality of 10 out of 10 most of the time, despite not being line of site with the transmitter. Wind and rain cause some drop outs on the Freeview reception in the set top box, but the new TV has not dropped out yet, despite some shocking weather at the weekend! Ooh yes, last night (for the first time) we recorded two programs on the HDD recorder, while watching a third program directly on the TV – how cool is that! If we wanted to, we could attach a USB device to the TV and record three programs at once, but if we wanted to watch a fourth program, we would need to decamp to the family room to watch the other TV!